Inscription (Eng) (Front): SACRED TO THE MEMORY OF FANNY THE DEARLY BELOVED WIFE OF S.S. BENJAMIN, BORN IN LONDON 23RD AUGUST 1867, DIED MONDAY 11TH JULY 1892, (16 TAMUZ 5652) GONE IN LIFE’S BRIGHT MORN GONE IN HER YOUTHFUL BLOOM. 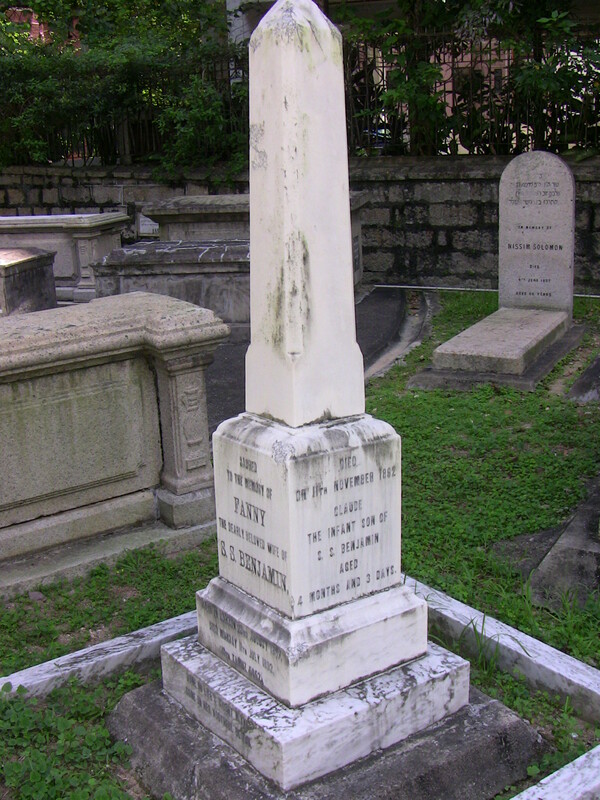 (Right): DIED ON 11TH NOVEMBER 1892 CLAUDE THE INFANT SON OF S.S. BENJAMIN AGED 4 MONTHS AND 3 DAYS. Historical Claude was born prematurely. 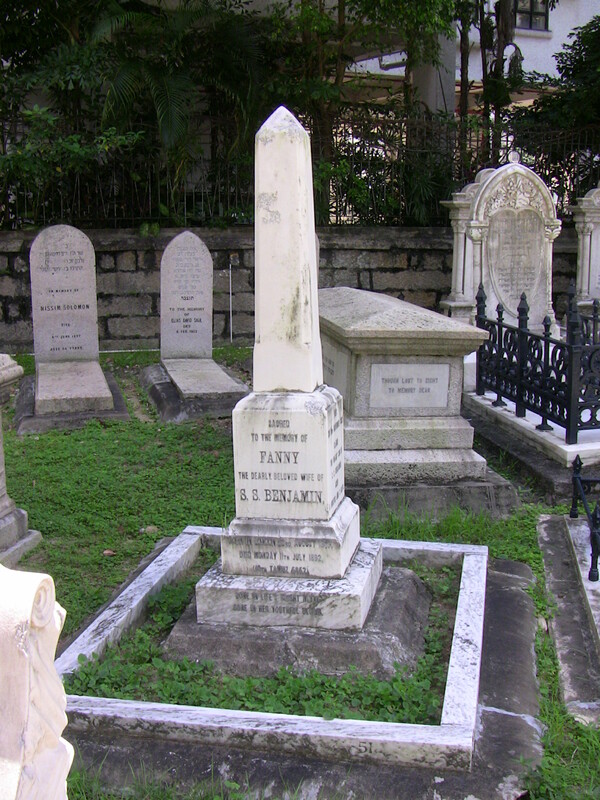 Fanny and S.S. were married on August 18, 1891 in the Bayswater Synagogue. The van Nierops lived at 65 Shirland Road. Evelyn Stuart-Smith (1E6) was living across the road at the time. Did they know each other? Evelyn was a few years older than Fanny. S.S. Benjamin was a partner of Ellis Kadoorie in the brokerage known as Benjamin & Kelly. (Kadoorie was Kelly.) In an 1898 jurors’ list, an Arthur Van Nierop is listed as a clerk at Benjamin, Kelly & Potts. He was probably her brother. Arthur lived with the Benjamins at 4 Cameron Villas, The Peak. After Fanny’s death, S.S. married Dolly Cohen in 1893/4 and they had three children – Cecily Hope (b. July 5, 1897, HK), Winston Leslie Sassoon (b. May 1, 1904, Shanghai; d. March 23, 1905, Shanghai) and Margaret Esme Sassoon. Winston died of meningitis. Margaret married Harry Jacobs in 1941 in Las Vegas and they had one daughter and one granddaughter (Kathryn Harrison). Margaret had been previously betrothed to Elly Kadoorie’s son, Lawrence. Dolly died on March 8, 1931 at Roquebrune-Cap-Martin, France. S.S. died on March 14, 1934, at his home (Villa Edgerton) in Roquebrune-Cap-Martin. He was 72. He had arrived in Shanghai in the 1870s as an employee of David Sassoon & Co. He later moved to HK where he joined the Stock Exchange but returned to Shanghai in 1900. He retired in 1917.